The space invaders ready for a war of the worlds. Or maybe just a close encounter. I pick up lots of small items at sales, and I have always had a pretty vivid imagination. I like to create creatures out of objects. 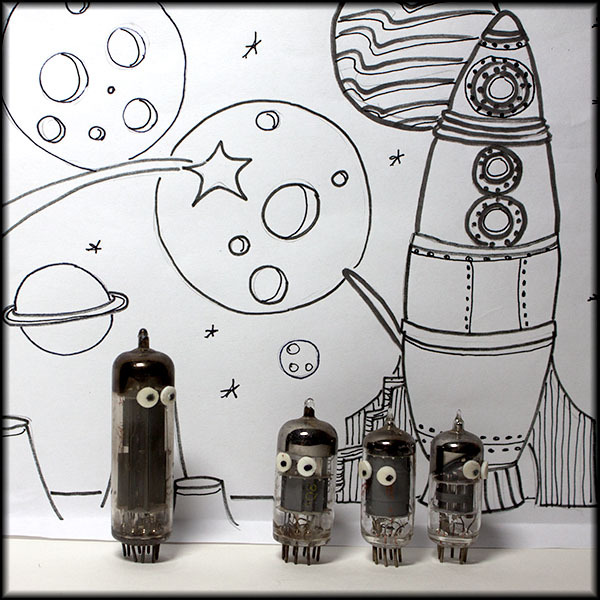 The TV tubes are the perfect example. 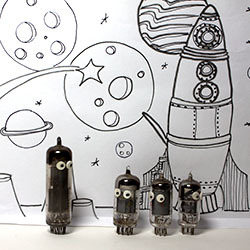 At one point you have just TV tubes, (which are really pretty amazing works of art by themselves), but if you put eyes on them, you give them a personality. And if you give the creatures a landscape, you have a whole story. It’s true, one picture is worth a thousand words. 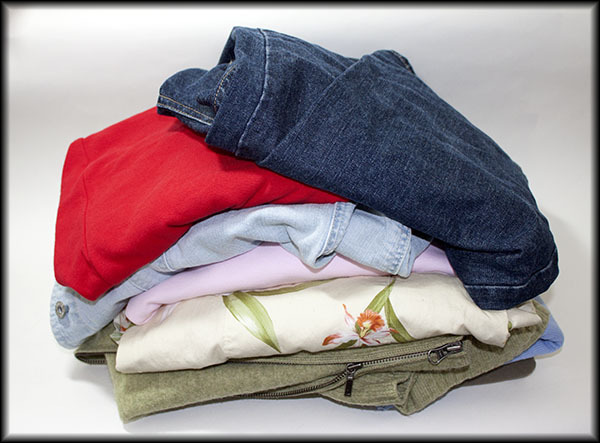 We had very nice weather for Garage Sales this weekend, and it was what I like to call a “clothes” day . Occasionally, we are able to go to Garage Sales and buy clothes that we might like. Clothes sales are really great if the items don’t go over one dollar. Twenty five cents is pretty great, that way if they don’t fit or you decide you don’t like them we don’t feel so bad putting them in the Goodwill bag. Some of the clothes we found this past weekend. So our first few sales this week were clothes sales. We eventually got down to the nitty gritty though. 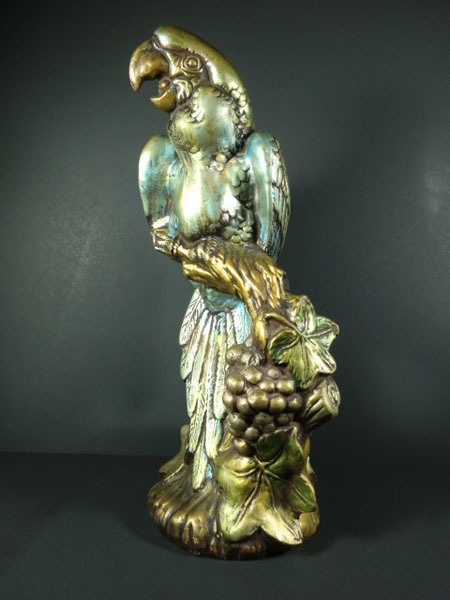 Estate sales (true estate sales) have got to be the very best sales ever. There is usually a bunch of junk mixed in with the nice items and truthfully, I love the junk. I really like it when someone pulls out a junk drawer and you get to go through it. It is always best to be cautious though. You never know what may be lurking in the drawer, ie, razor blades, nails, tacks. Anyway, I have certain items I like to pick up. 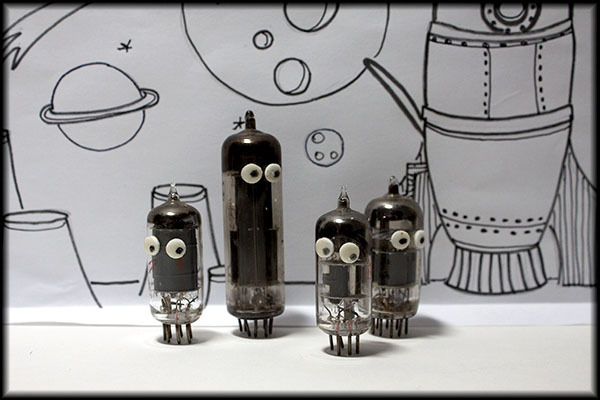 Lately, I have been drawn to old TV tubes, (they really do look neat, almost like little vintage robots). Dresser hardware or cabinet hardware is another item I try to pick up, but it does need to be vintage and have a cool patina. Keys, I pick up most keys that I find. I also like to pick up little pieces of old toys. If the item you find is really greasy or dirty you can put it in a mesh bag or a dishwasher basket and run it through the dishwasher and if it gets destroyed you just throw out the pieces. Now, if I ever figure out what I am going to do with the things I pick up and collect, I will pass that on, but for now, they just sit in jars and I look at them and dream. One of the more interesting garage sale items I found this past weekend is a booklet titled Business Letters and How To Write Them printed originally as Business Executive’s Handbook in 1937. I love these vintage pamphlets. They are an intimate conversation with history. These authors are speaking to you in the same voice they spoke to their contemporaries. I can learn and marvel at the conventions and manners of the early 20th century without the distortions of nostalgia and history books. The section on libelous letters is as useful today as the 1930’s. To quote the authors: “The law cannot prevent a person from writing anything he pleases, but it can and often does make him responsible for his statements.” This seems to be good advice today as the seeming anonymity of the internet pushes the boundaries of gossip versus libel. If you insist on commenting about your sister’s bad haircut in your blog, the odds are good that she will discover your perfidy. If a statement could be proved true it was not libel. If “the reputation of a living person or the memory of a deceased person” deserved to be “exposed to public hatred, contempt” and ridicule, lawsuits were dismissed. Also, “a libelous letter or comment must be communicated to a third party to be actionable.” It has to be read by someone other than the person defamed. Calling your sister ‘a dirty dog’ in the kitchen is not libel unless your mother was there too. This makes a lot of sense as having lawyers in the middle of you and your spouse’s private disputes would be costly as well as awkward. 1937 was the middle of the Great Depression and most of the libelous acts mentioned have to do with bankruptcy, insolvency and dereliction of duties. I suppose that it is libelous to say that corporate CEO’s are ‘dirty dogs’ who cannot be bothered with the ethics of business or concern for the future of their companies, but we can comment on the excesses of their salaries in comparison to our own. As the salaries are well documented and how dirty CEO’s are would depend on how many showers they take in a week. accept, except. ACCEPT means to receive with approval, reply to affirmatively, agree to; EXCEPT means to exclude, make an exception to. I accept your offer to help me with grammar and semantics with the bad grace you would expect. I except your mother from any horribleness resulting from my bad attitude. Really, people are bemoaning the loss of writing due to the influence of computers and texting and smart phones, but I think people are writing more than they ever have since there is such an eager and vast audience out there waiting to be entertained. At least someone out there in the ether will agree with what you say and even make the same writing errors you do. Lanterns and Fortunes and Dragons, Oh My! Lanterns, banners, dragons and even uniforms from McDonald's sauces promotion. Another weekend has come and gone. It was over way too quickly. But, Lynne and I hit some interesting garage sales this weekend. If the sales don’t seem to be going very well, I have a game I like to play. I try to find the item that the seller puts out and says, “Go ahead, put it out, someone will buy it”. To me a garage sale is a safari, or a scavenger hunt. My mind is going a hundred miles a minute trying to figure out what I will do with the item I just picked up, how does it fit in with what I have? Do I have any idea what I may use if for? Garage sales are not for the weak willed. A lot of thought goes in to any object you pick up, often, it is exhausting. After a summer of sales, I am usually glad to see them end and give myself a rest, and then, after a few weeks I am back to craving sales again. Each week I would like to document the strangest, oddest, or neatest item we have found at a sale. The one for this week is a real doozy. After a bit of research I found out that in 1986 McDonalds had a promotion on their McNugget sauces. The sauces were Teriyaki, Sweet and Sour and Hot mustard. The nuggets included a carry out box and chopsticks and even a fortune cookie. For some reason, I do not recall this, as I really am a McDonalds Freak. 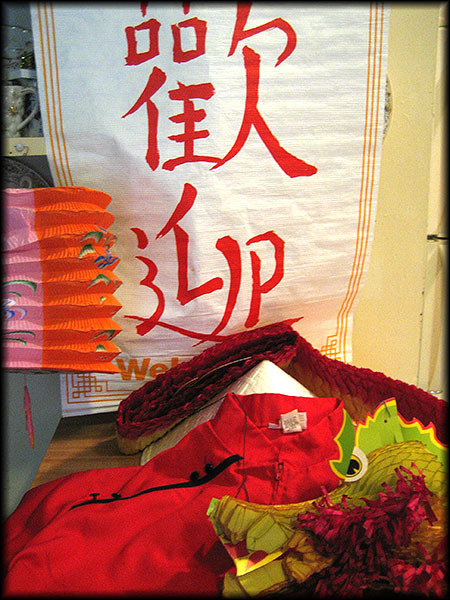 Anyway, at a local sale, I found 4 oriental uniform shirts, 2 large paper dragons, 4 oriental hats, 2 banners and 10 paper Japanese Lanterns. The lanterns were what really sold me. One of my boys promptly confiscated a dragon and put it on his ceiling in his room, and it looks really good. As for the rest of the items, I think I will use the lanterns in my room, and I will probably keep the rest packed, until I decide if I can sell it or hang on to it for posterity. After all, they really don’t take up a lot of space. (Keep telling yourself that Cheri). Mel's best garage sale find. My bestest garage sale find. Another man’s trash… but I found this parrot absolutely stunning. Old and paint peeling but with a gorgeous lustrous sheen. I love him. He has a small planter behind him. He’s over a foot tall. No Crying Over Spilt Milk! My best garage sale find. 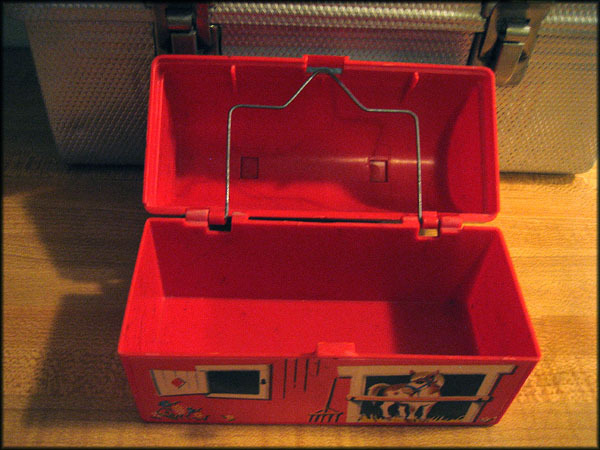 My most fantastical garage sale find ever has got to be the small lunchbox barn that I found at a church rummage sale.This small little lunchbox offered me a chance to relive my youth and feel vindicated all at once. Double whammy. I was rummaging in boxes when I spied something that looked a little familiar. As I picked it up things went swoosh. I’d swear it really was a swoosh. 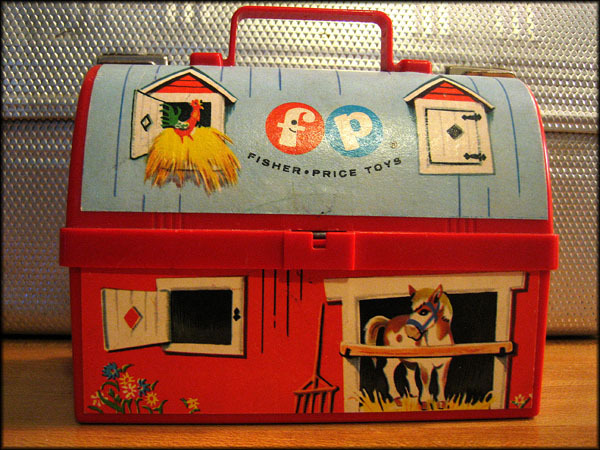 I was taken back to the kitchen of our house where we lived when I was 4, holding a toy lunchbox that looked like a little barn. 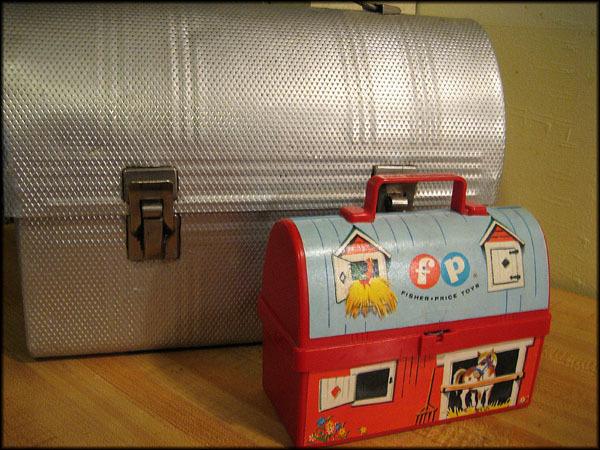 It had the usual wonderful decals that marked it as Fisher Price, it was red and it had a little handle to carry it and inside of the top lid was a play thermos that looked like a silo. It was just too utterly awesome. The first thing I did was take the thermos/silo out and fill it with milk, and put it back under its little hanger in the lid. I proceeded to go to imaginary work, on an imaginary construction site, until imaginary lunch. I picked up my little lunchbox and opened it. Was I ever in for a shock. My thermos/silo had become a gooey mess, the milk had leaked everywhere and I remember thinking in my little brain, “what did I do”? Things get a little sketchy after that, the silo was thrown out and milk had gotten on the decals. As I flashed back to the present, (swoosh again) I picked it up and held my breath, I slowly opened it. Nope, nothing. I breathed a sigh of relief and silently forgave myself and every other kid who been silly enough to think they could keep milk in a cardboard silo. Needless to say, I snatched it up, and it reminds me of the simplicity of being a kid because seriously, if it looks like a thermos, It ought to be able to be used as a thermos. What is your most amazing garage sale find? Greetings to my fellow family blogettes. I would like to ask all of you, “What is the bestest or favoritest item (you feel) that you have picked up at a garage sale, auction, rummage or even an antique store. I know what mine is, but I am really not so sure what yours are. So, get your thinking caps on and start perusing your favorite finds. This challenge should be a lot of fun. This is a good find with a good story. 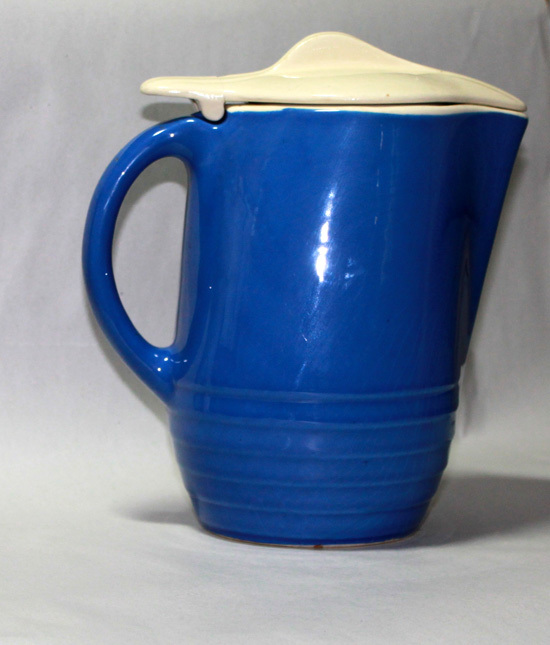 I love old pitchers and anything refrigerator related. Sis pointed this out to me while on her way to other things. (See, I told you she sees all the good stuff.) I stepped casually in front of a few others whom it turns out wanted something else…but you can never be too careful when there’s an item that meets two of your collectible criteria. Keep those elbows out and pointed. You can imagine my disappointment when I noticed that the lid had the pivoting end broken off. I was going to buy it anyway because the price was too good to be true, however, I wouldn’t be able to use it the way it was meant to be used. Who among us would want to take a lid off and have to place it on the table when you could slip it open ever so casually with your thumb? That’s the genius of marketing. Then I noticed that the break looked very new and since our motto is ‘always keep looking,’ I nudged the sis. And of course, she does–after she secures the keys. And of course, they are quite willing to oblige. Everyone likes her. It’s not fair. But she’s too nice and will let me make her do the asking. Sis got permission, marched into the kitchen, reached into the cupboard and produced the pivoting end. Just like that–Magic. 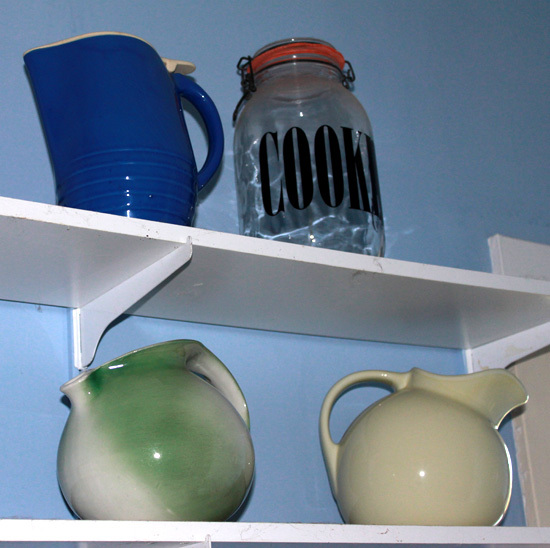 I took the pitcher home, glued the lid together and it is living happily on my shelf. 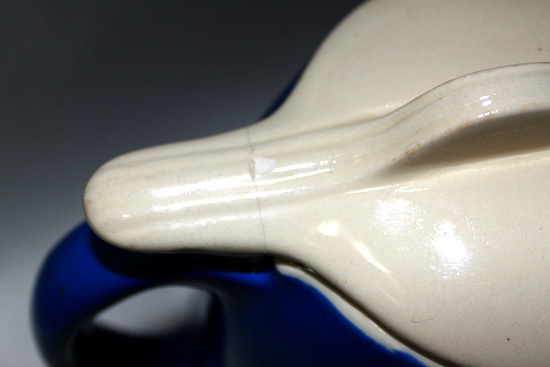 I took a picture of the mend to show that cracks are very subtle. If you can put something back together it’s almost as good as new and it’s always cheaper. My sister is the master of garage sales and I refuse to go to a sale without her. I can walk through a sale and see nothing, nothing and more nothing. I go home and start muttering things. Not good things. “I wasted my gas for this! Does everybody buy from the same stores? Are all the vintage items stored away in collections?” But when my sis is along the world is our shopping mall. She sees the shelves I’ve been wanting in the back corner under a furnace, the comforter that is just perfect for padding my couch cushion in a box covered by Happy Meal toys and that vintage kitchen utensil with the red handle hiding in a carton of plastic lids. I don’t pretend to understand it. She’s a genius and I float behind in her tailwind gathering the good finds. It was hot today and getting hotter, but we found some cool deals. Our first sale was so much fun that we didn’t need to go anywhere else. Of course we did go elsewhere but that urge for the hunt had been satisfied and anything else we found would be gravy. Chicago is the nearest city with an Ikea and I have despaired of ever getting there. Two and a half hours is not really that long to spend in a car, but the thought of traffic and the cost of gas have kept me rooted in this small town. Anyway I found some items from Ikea at a sale today. I don’t know what they are but I bought them because I figure I can go on the internet and learn the details later. That is the way to shop a garage sale.